The biggest feature of the AI 2.0 products launched by the Chinese medical imaging AI company is the deep integration of AI and healthcare in three areas: value fusion, data fusion and process fusion. 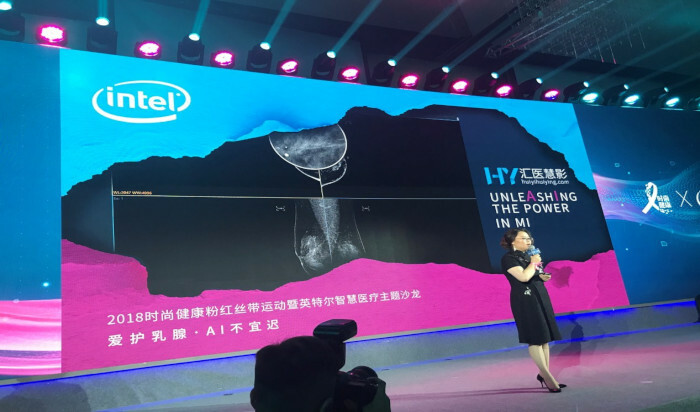 Huiyihuiying, a Chinese medical imaging artificial intelligence company, yesterday announced the launch of their new AI Full Cycle Health Management Cloud Platform, which consists of two separate platforms for different health concerns: the Breast Cancer AI Full Cycle Health Management Platform and the AORTIST 2.0 Aorta AI Cloud Platform. The platforms are based on AI 2.0 technology and were introduced at Chinese Congress of Radiology 2018 (CCR 2018) in the National Congress Center on November 8, 2018. The Breast Cancer AI Full Cycle Health Management Platform is committed to the whole cycle of breast cancer diagnosis and treatment, from breast molybdenum target screening to nuclear magnetic diagnosis to pathological diagnosis. The AORTIST 2.0 Aortic AI Cloud platform is to provide a process for the identification of breaks, choosing cardiac stents, and the prognosis of follow-up treatment. Compared to medical imaging products based on AI 1.0 technology that only cover disease screening and auxiliary diagnosis, the biggest feature of the AI 2.0 products launched by Huiyihuiying is the deep integration of AI and healthcare in three areas: value fusion, data fusion and process fusion. According to a research article, “Heading toward Artificial Intelligence 2.0” by Yunhe Pan, AI 2.0 technology will possess distinguishing features, such as the process of combining data-driven and knowledge guidance into autonomous machine learning that is both explainable and more general. The new platforms are the result of investment from Intel Investment and Core Kinetic Energy Fund. Based on a MIT Technology Review report in March 2018, there are some 131 companies currently working on applying AI in the country’s healthcare sector. The rapid development of AI in China is also prompted by the government’s push to transform the country into a “nation of innovation.” A year ago, China’s Ministry of Industry and Information Technology (MIIT) released the Three-Year Action Plan to Promote the Development of New-Generation Artificial Intelligence Industry (2018-2020). This new plan calls for China to achieve “major breakthroughs in a series of landmark AI products” and “establish international competitive advantage” by 2020. Founder and CEO of Huiyihuiying Xiangfei Chai said, "In order to promote the development of medical imaging AI, it is necessary to integrate multi-border integration of AI enterprises, hospitals and academic institutions so that the new technology of AI will be truly landing." "We believe that the application of multi-modal image data and the full cycle coverage of disease diagnosis and treatment are the trends of AI industry development. There will be more and more diseases in the future cured by AI applications," co-founder of Huiyihuiying, Na Guo said.